Paul Lefeuvre is an Associate in the International Arbitration practice. His experience includes energy, construction, business combination and commercial disputes conducted under various rules, including the ICC, ICSID and UNCITRAL Rules. His sectorial experience includes arbitrations in the oil & gas, mining, renewable energy, transport and logistics industries. 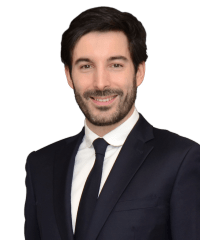 Prior to joining our practice in 2012, Paul Lefeuvre trained in the litigation and arbitration departments of a number of firms, including in the Middle East. A consortium of European and North American companies in an ICC arbitration in London against a European renewable energy company. The post-acquisition dispute arose from representations & warranties in relation to compliance with wind farm regulations contained in a Share Purchase Agreement. French law applied. An African railway operator in a UNCITRAL arbitration against an Asian railway rolling stock manufacturer. The dispute arises from an agreement for the supply of railway rolling stock. The law of the Claimant’s State applies. An international logistics company and port operator in two ad hoc arbitrations arising from the breach of a concession agreement and a framework agreement. The first arbitration was brought against the port authority of an African State. The second arbitration was brought against the same port authority and the State. An African State-owned energy producer in a dispute with a foreign partner arising from an exploration and production agreement. The dispute was in relation to the adoption by the African State of new tax legislation (windfall profit tax) as well as in relation to the determination of parties’ share in a joint oil reserve (unitization). Sonatrach as Respondent in an ICC arbitration in Geneva initiated by Total Algérie SAS and Repsol Exploración Argelia. The dispute was in relation to the interpretation of contractual provisions of a production sharing agreement regarding windfall profit tax and alleged tax stabilization provisions. Over $400 million was at stake. Algerian law applied. An African energy company as Claimant in an ICC arbitration in Geneva brought against the African subsidiary of a European energy company and a European holding company. The dispute arose from a contract for an oil exploration & production agreement. The law of the Claimant's State applied. An African energy company as Respondent in an ICC arbitration in Geneva initiated by three energy companies. The dispute arose from a production sharing agreement. The law of the Respondent's State applied. A contractor in an ICC arbitration in Toronto against an African mining company. The dispute arose from an agreement to construct a pipeline from a mining site to a processing plant and involved issues of design changes, unforeseen physical conditions, and other events that delayed the completion of the project. The law of Ontario applied.